My art is symbolic of this country’s multiple canons. It’s significance is that it employs the insertion of little-known chronicles into the cultural landscape. Influenced by the contemporary artists, Faith Ringgold, Robert Rauschenberg, Jasper Johns, and Joseph Cornell, I make art that speaks of personal, family, community, cultural, and historical stories. To retrieve these narratives I interview people that I find heroic in order to explore disquieting matters that transform me and viewers to a place of healing, connecting, and understanding. 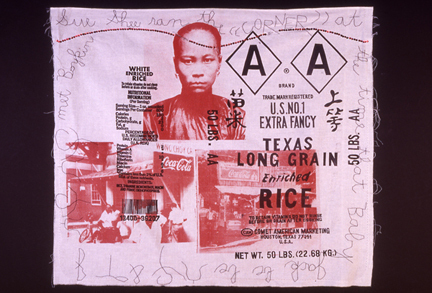 I use cloth rice sacks, sequins, beads, old suitcases, scanned photographs, magazine text, Chinese funeral paper, flags of the United States, needle, and thread to create my mixed-media installations. In acknowledgement of my identity as an American of Chinese descent I frequently use Chinese and English text in my work.